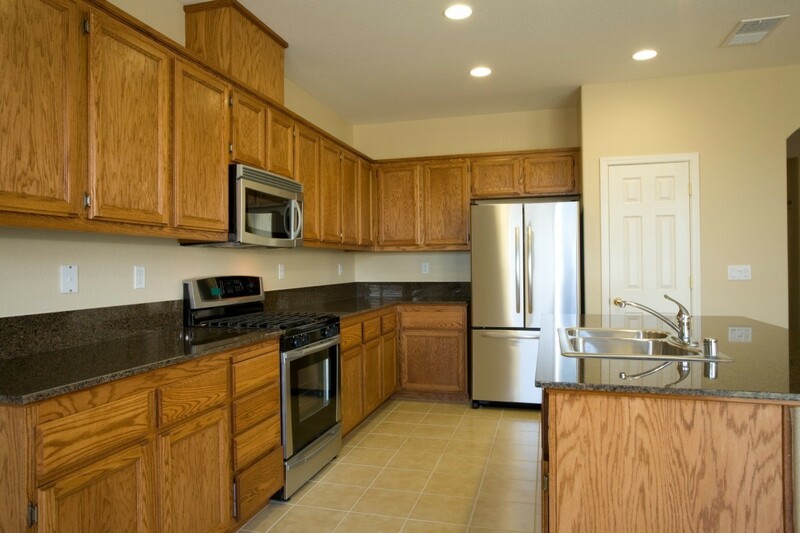 The finish on your kitchen cabinets plays a role in the choice of wall paint colors. This is a guide about paint color advice for a kitchen with oak cabinets. I have a long kitchen, galley style. The sink, dishwasher, stove, and microwave are on one side and the laundry closet and refrigerator are on the opposite wall. The ceilings are 8 feet. The cabinets are natural oak and the counters are black and dark blue fleck. The floor is vinyl and has dark blue, grays, tans flecks in the pattern. The dinning room is attached, well it's really an eat in, I guess. There is no dividing wall for the space, it's open to the kitchen. Right now the kitchen is a blue/white, more blue than a cool white, but not much, called Day spa. We are thinking of making the kitchen a chocolate, mocha brown. I am trying to decide it that is a good idea. We are thinking warm, inviting, etc., but we don't want it to feel small either. You're right that too much brown can make a room feel uncomfortably close. Have you thought instead of trying a lighter shade of the gray in your floor? Gray walls (not too dark) can cause the rest of the colours in your room to really pop. Next time it's gray outside have a look at how well the evergreens and anything in a vivid colour stand out against the gray, it's amazing! You can buy gray paint with chocolate undertones, that makes for a 'warmer' feeling gray than one with blue undertones. What color or different type of painting should I paint my kitchen? My kitchen cabinets are light oak, counter tops are blue speckled, appliances are stainless, and the floor is ceramic gray with hints of light beige. The ceilings are pine as well as the wall by the refrigerator. If you use a lighter shade than one of the colors in the floor, you will make the room appear larger. The other choice that would accomplish this would be to paint the walls slightly lighter than the cabinets to make it appear as all one. I'd like to see you paint the ceiling a lighter color. White that has 50% of your wall color added to it. I want to paint my kitchen walls that are currently white. The white shows all the cooking grease and my son's finger tips on the ceiling from him jumping up in the air and touching the ceiling. My cabinets are a oak wood, I also don't know if the paint should be flat or semi-gloss. Please help. NEVER use flat paint in a kitchen. Semi-gloss is the usual. Even for the ceiling. You need the surface to be washable. Flat paint is like a chalkboard and will absorb grease and steam from cooking in the air. For color there is a lot more to consider. There are three common colors of finish on oak cabinets. Which do you have? What color is the floor? What color are other rooms that are visible from the kitchen? The beauty of natural wood is that it will go with just about any color. Pick out colors that appeal to you and put a dozen or more paint color samples on the wall. Every day as you look at them some will become less attractive and others will stand out. I have surprised myself by finding something I liked better than what I thought I wanted! I have medium to dark green ceramic tile floors in a large kitchen. I have medium orangish tone oak cabinets and off white walls. I just tried painting them light gold and they came out mustard. It's awful and looks terrible with the darker orangish tone oak cabinets. I need to paint over this asap. The living room which you can see from the kitchen is a medium sage green. What do I paint the mustard over with? Should I go back to off white. I do not like gray, blue, or yellow. I would choose a light tan or a lighter green in the same color family as the tiles. I have light sky blue countertops, honey oak cabinets, and light beige colored tile. I have a neutral/beigey colored wallpaper, it's textured and is very decent. There had been fruity paper below it and I took it off, so I was thinking of doing a coco colored wall with a chair rail. I also have a color block rug under my table with different colors in it. But I am wondering if I take down the paper, what color to paint the walls. I also am looking to purchase a new kitchen table, what color would look best with each decor? Would a black one be OK, or one with a oak top and black legs? Help. How old are your kitchen table and chairs? The condition of it looks great, if I were you I wouldn't buy a new one. The furniture that they are making now is junk. Your kitchen floor looks identical to the one that we had installed before we sold our 3-bedroom house. If you must have a rug under your table it should be a bit larger. At least where the legs of the chairs sit on it. All the wood seems to match. I wouldn't change that. The black top table sounds nice too, but it will show all the stains and food "drippings"! from experience. I have basically the same cabinets. I went with it instead of against it. I bought a "peanut butter like" color for the walls, and 2 shades lighter for the trim. Wal-Mart brand "Harvest Spice" #94191 for the walls and "Praline" # 93191 for the trim. I used a "forest" theme for my decorating items. Since you have a blue counter top you could use blue decorating items. I think that would look nice in your kitchen, plus these colors hide dirt better than white. Good Luck! My kitchen is 13.6 feet and has navy blue marble counter top and island. The cabinets are oak and the flooring is a different shade of brown. I was thinking a gold, but am not able to send pictures. Thank you for any help. I have a large kitchen, but it doesn't have much natural light. The work tops and cupboards are oak and the tiles are black and cream. I have tried a pale green, but it doesn't look right. I am at a loss as I don't want to just paint it cream. Paint the cabinets white. Paint the unmatching tiles black.There are new paints you can use to successfully achieve this. You didn't mention the color if the walls, but think a color for the walls like at Olive Garden. Beautiful! Paint the cabinets white. Paint the unmasking tiles black.There are new paints you can use to successfully achieve this. You didn't mention the color if the walls, but think a color for the walls like at Olive Garden. Beautiful! I have a dark blue laminate countertops with oak cabinets. My floors are white. What color should I paint my kitchen walls? I have only two walls to paint, that are behind the cabinets. Right now they have a fruit wallpaper. I would do beige or pale buttery yellow. A light, compatible shade of blue, a soft yellow, peach, sage green, rust or red. My kitchen has dark oak cabinets (kinda orangy), a dark green countertop, and a light gray floor. I can't seem to find a color for the that would go with this combination. Any suggestions? Sounds rather dark. You might consider an orangy-grey, a warm grey with an orange cast would warm the room, but a grey with a green cast might also work. Of course, if you want something completely different, a very definite bright orange that picks up the orange of the cabinets might work. This doesn't sound easy to find the right color so I would suggest plenty of paint chips, first to decide the general color, and then refine those choices. Good luck. Apricot and peach shades spring to mind. What color should I paint my kitchen? The cabinets are a golden oak. The countertop is light beige. I have a chair rail in the kitchen. Also, what color hardwood would you put down? 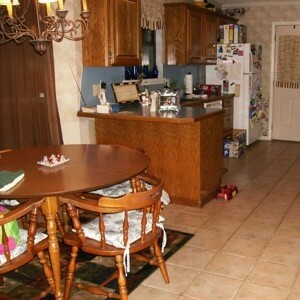 Since the cabinets and countertop are neutral, I would go with a bolder color for the walls and/or floor. Perhaps sage for the walls and a cherry wood for the floor? Or, could do cranberry for the walls if you're that bold. Dark floor, walls sea foam green. I just bought a home with a lemon yellow kitchen that needs painting asap. The cabinets are a light to medium oak and the flooring is wood a pecan shade. The appliances are black. The counter top is black laminate, but I will eventually be changing it to a ceramic tile with a matching backsplash in a neutral shade. The kitchen is on the smaller side and has a big door wall. There is a half wall separating the kitchen and the family room. I am not much into bright colors and consider my style casual. Thank you for the help. Small kitchens with little natural light require light paint colors. Pecan wood, black appliances would look good with a pale peach or soft blue or green. I have black appliances, medium oak cabinets, darker gray countertops with black, blue, and almond specks and off white and light gray flooring and lots of windows. I have a laundry room right off the kitchen with white cabinets, light gray countertops, the same flooring and it was just painted butter churn yellow. The Kitchen is stumping me. Blue would look nice and compliment with the yellow of the other room and the gray, white and black. I would choose a periwinkle blue or heather blue. I would like advice for wall and tile color that will match my oak cabinets and dark green counter top. I also have oak cabinets and dark green counter. I went with a pale yellow and I love it. Question: What Color Should I Paint my Kitchen Walls? My cabinets are medium shade of oak with black and chrome appliances. The flooring is a woodgrain pattern. My countertops have black and brown with some cream colors in it. I think a very light beige/tan would look great with the other colors in the room. Very light though so the kitchen isn't too dark. I have removed the wallpaper from my kitchen walls and now I want to paint. My appliances are black with oak cabinets, beige countertops, and a dark blue floor. Can you give me colors? I have browns in countertop, gray backsplash, and light oak cabinets. I am wondering what color to paint my kitchen. Browns complimentary colors are blues. Google brown and blue kitchens and when you click on images, you will get lots. Now, for some reason, aqua is so popular right now you might get way too many of those. But keep trying...you will see some lovely shots. My kitchen has a beautiful dark blue counter top and oak cupboards. The ceramic tile floor has greyish tones with a tan grout. I would like to repaint the walls. Any suggestions? I have a window above sink and one in door. To play up the counter color, I would suggest a true light yellow. Pick up the blue and yellow in curtains. I saw some beautiful one that were made of quilting material sewn in squares. The light coming through the blue and yellow was so cheerful. You could also use the tan as you already have four colors - blue, tan, oak, gray. It would look best is you used tints (color plus white) or shades (color plus black) of colors you already have. Perhaps curtains the colors of the cabinets or a light tan with ribbon the same or nearly the same as the counters. Hope this helps. 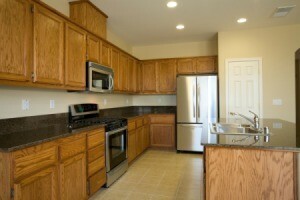 I have a fairly large kitchen with lots of golden oak cabinets. My flooring is one year old and is brown and beige. It is linoleum, but has the look of ceramic tiles. My appliances are stainless steel. I am looking for suggestions for countertop and backsplash colors, as well as, paint colors. Brown with gold counter top and chocolate walls. What color paint will go in a kitchen/dining addition with darker oak cabinets and harvest gold Formica counters? White will go with any color, good luck. I have oak cabinets, black granite with silver specks, and gray ceramic tile floors. What color should I paint the walls? I chose a metallic gray color and don't like it. My kitchen cabinets are medium oak with green counter tops. My floors are light to medium hardwood. What would be a good wall color? I have very light unfinished oak cabinets, a mostly light beige to brown speckled granite counter tops, a brownish rectangular brick vinyl flooring, white trim, and almond appliances. What color should I paint the walls? Should I stay with beige/brownish hues or go with a heritage greenish color? I have oak cabinets, white appliances, a gray mable look tile floor, and white countertop with black gray white speckles. What color should I paint a small kitchen? I am having a hard time picking out a color for my kitchen walls. I have oak cabinets, oak trim base board, blue pearl granite counter top, light blue pearl granite back splash, and what frame windows.